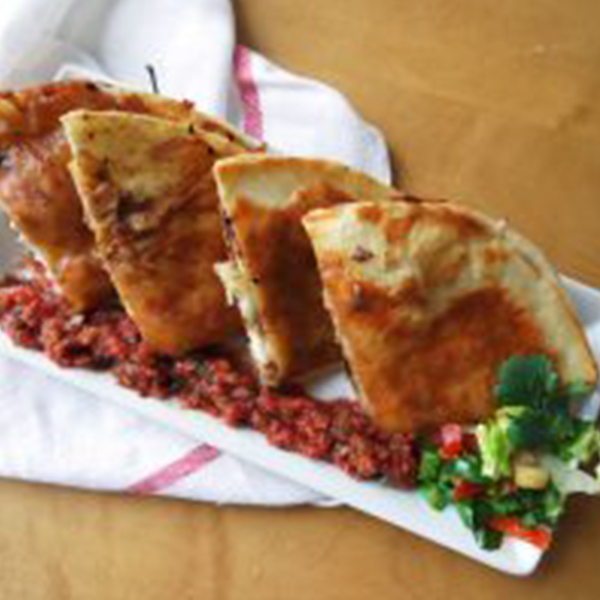 Enjoy a festive meal with some home made fajita quesadillas. Serve with guacamole, sour cream, and your favorite flavor of Cocina Fresca Salsa. What you'll need: Line Created with Sketch. How to make it: Line Created with Sketch. Clean and chop up the onion into long strips. Slice the peppers into long strips. Clean and slice chicken breasts, beef, or both into long strips and place in a bowl. Add a tbsp of the fajita mix spice blend to the fajita meat and mix well. In a large skillet, heat 1 tbsp of the olive oil and add the fajita meat to it. Cook fajita meat until fully cooked, and it's slightly charred, but not burned. Remove the meat from your skillet and wipe the skillet clean. Add another tbsp of olive oil to the skillet and heat it up. Add the onion and cook for a couple minutes until it's slightly translucent. Add the peppers and the fajita mix and mix well. Cook for a couple more minutes so the peppers cook slightly. Add the fajita meat, mix with peppers and onions, and cook for a minute. In a clean skillet, add a bit of the butter and melt. Add a tortilla and move it around until it's buttery. Add a little bit of the meat mixture and onion mixture on top of the tortilla, and about ¼ cup of cheese, depending on how you like it. Add another tortilla on top and pat it down. Now flip it over and cook on the other side until the other side is nice and golden. Remove from skillet and cut into quarters. Repeat these steps with the remaining tortillas. Serve with guacamole, sour cream, and your favorite flavor of Cocina Fresca Salsa.